A colorful, flavorful and nutrient-rich salad with black beans and salmon that pack a high protein punch. Bright flavors from tangy Cotija cheese, cilantro, honey and lime add an extra kick to this dish. In a medium skillet, add drained and rinsed corn. Over medium-high heat, char corn kernels in dry skillet until slightly blackened, about five to eight minutes. Remove from heat and set aside. Add all dressing ingredients into a blender or blend using immersion blender. Set aside. 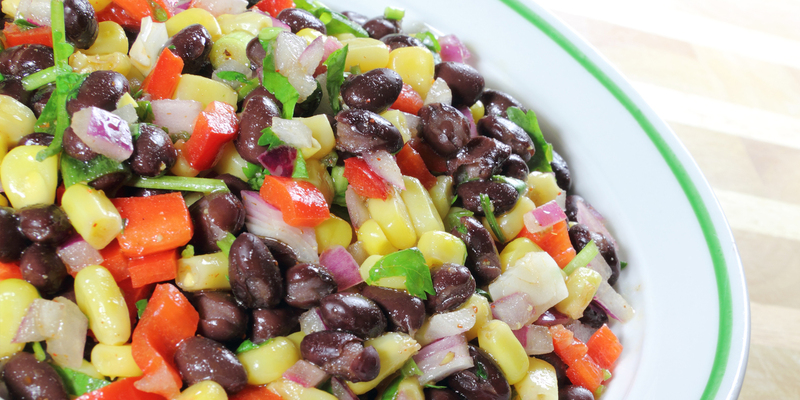 In a large bowl, mix chopped lettuce, black beans, red pepper and charred corn together. Add salmon, diced avocado and about half of the prepared dressing to bowl and mix to combine. Top salad with crumbled Cotija cheese.